Approximately 8% of all persons reporting musculoskeletal diseases in MEPS for the years 2009 to 2011 are under the age of 18 years. Roughly one in four (24.5%) musculoskeletal diseases occurs in persons age 65 years and older. 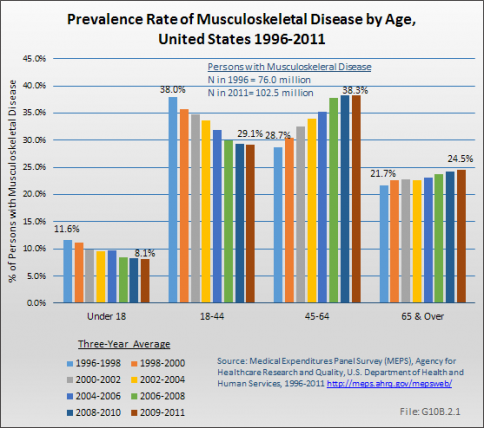 Almost 40% of musculoskeletal diseases occur among persons age 45 to 64 years. Overall, more than 75% of musculoskeletal diseases are reported by persons under the age of 65 years.